I hope I’m not the only one who thought corned beef and cabbage came from Ireland. Or at least somewhere across the pond. I wanted to be sure of the fact before I said so here and looked like a big dummy. So I went in search of the origin. According to the History Channel, “Corned beef and cabbage is as Irish as spaghetti and meatballs.” HA! You can read more about it here, but to sum it up, corned beef and cabbage is an American creation. However it came to be, I’m just glad it did because I love it! I've seen this cooked in the oven and even in a crock pot but I just make it like my mama made it. In a pot. On the stove. And then serve it with some crusty bread, good mustard and dark beer. Place corned beef, fat side up, in a large pot or Dutch oven. Add enough water to the pot to just cover the brisket. Add seasoning packet from corned beef, bay leaf, peppercorns and salt to the water. Cover and heat over medium heat until simmering. Do not let water come to a full boil! Simmer over low to medium-low heat for 2 hours. Add 30 minutes to this cooking time for every additional pound if cooking a larger brisket. Add potatoes to stock, cover and continue simmering over low to medium-low heat for 30 minutes. Wash cabbage and remove any damaged outer leaves. Cut cabbage into 8-10 wedges. Season wedges with salt and pepper and arrange on top of the brisket and potatoes. If your pot is big enough that the cabbage will be submerged in the stock, don’t season the cabbage with salt and pepper as the stock is plenty flavorful. Cover and continue simmering over low to medium-low heat for 30-40 minutes or until cabbage is tender. If the lid doesn't fit after you add the cabbage just cover your pot tightly with aluminum foil. Remove cabbage, potatoes and brisket from pot, cover with foil and let rest 10-15 minutes before serving. Cut brisket against the grain into thin slices to serve. You can absolutely add carrots and onions to this. Add them when you add the potatoes. I think that’s what they called an Irish Boiled Dinner. Again with the Irish thing! I thought it was Irish in origin too. I suppose because it is promoted mostly around St. Patrick's Day as part of the holiday menu. My mother (a New Yorker transplanted to Louisiana) always made hers on the stove, insisted you get the corn beef that already had the spices rubbed into the meat (not the little spice pack) and did the cabbage, potatoes and carrots. So that's how I make it, too. Just try finding one of those corned beefs that are already immersed in the spices and don't come with that spice pack. Haven't been able to find one in two years. The flavor is different. Love corn beef! I love corned beef and cabbage. But then-again, what’d you expect from an old ‘shanty Irishman’ born, bred and raised in New York City; now living in SC since ‘05. I never understood why people only ate this once a year. Corned beef and lamb were our ‘junk food;’ not any more. As my local friends would say, “They’s real proud of it” (expensive). Using only bay leaf, salt and peppercorns, you’re missing out on a lot of traditional flavors. I use a pepper mélange, coriander, dill seed, mustard seed, Allspice, cloves, cardamom and 1 or 2 bay leaves. And yes, corned beef is about as Irish as fried pickles is southern. Back in the 50’s, I used to get fried pickles in the Jewish neighborhoods down on the ‘Lower East Side’ of Manhattan. While actually not an Irish dish, it is an Irish-American dish. 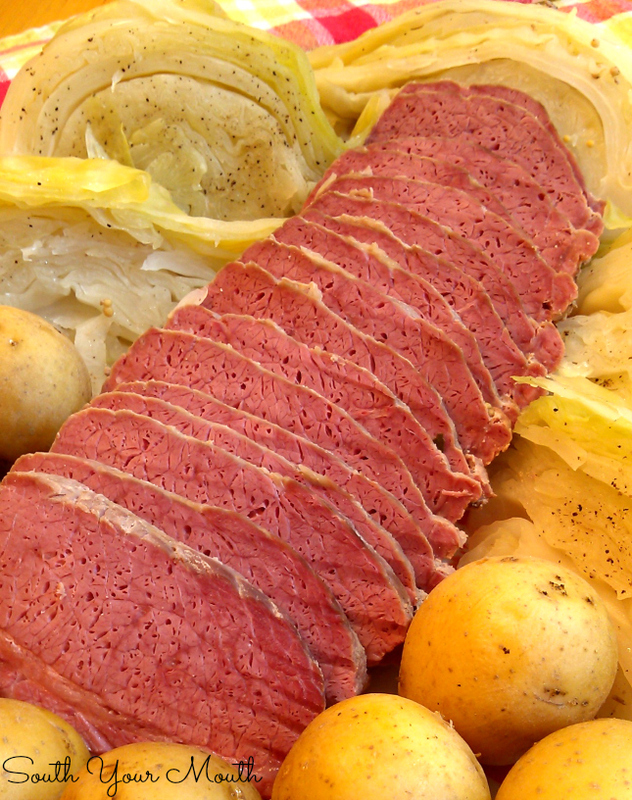 When the Irish came to America, Corned beef ended up in their cabbage & Potatoes as a result of not having Bacon slabs to season with and they resorted to the one meat that would keep "Corned Beef" which was cured in salt corns for longevity. Our local meat market makes their own Corned Beef and uses shoulder instead of brisket. Best corned beef I have ever had, exceptionally tender. I made it in my Instant Pot and it disappeared so fast I had to make a second one the next day.